Christine and Didier Hellio are a husband and wife team growing a range of crops at their farm in St Ouen. 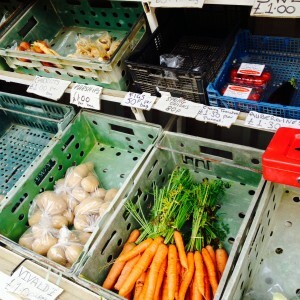 They supply fresh vegetables to a range of outlets on the island as well as their own farm stall. Christine kindly spent a few minutes telling us about life at Manor Farm. Hello I’m Christine, my husband and I farm about 350 vergees of land. 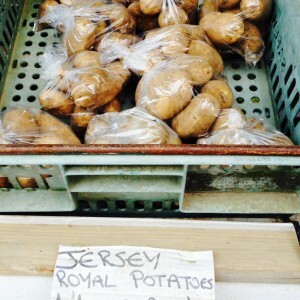 We grow the lovely Jersey Royal potatoes as well as supplying seasonal vegetables to the Co-Op, Classic Herd farm shop, Woodside, Amal-Grow and Lucas Bros farm shop. We are both from farming backgrounds and have been married and working together for 27 years. We are, I think, the only husband and wife team in agriculture on Jersey to solely work together every day, all day. After we got married we took over the farm from Didier’s parents and since then the farm has grown by 3 times the size. We have really pushed on with the vegetable side of the business over the years, and I think that the general public do realise that locally grown does mean fresher and does mean the vegetables last longer. Didier’s day starts about 5.30 am, as we like the deliveries to our customers to be finished by just after 7.00 am. That way be have the whole day to get other work done. I start a bit later getting veg weighed and packed to put out in our honesty box farm shop. On a typical day we may have planting to do, as we stagger plant our veg so that it doesn’t all come together at the same time. As well as weeding which I think is the job I like the least. Orders for the next day come in from about 2.30 pm and I usually get them ready and loaded in the van by 6.00 pm. The Jersey Royal potatoes are always the most popular produce in the spring/summer and Brussel sprouts in the winter, but I love the sweet potatoes that we grow on our farm. 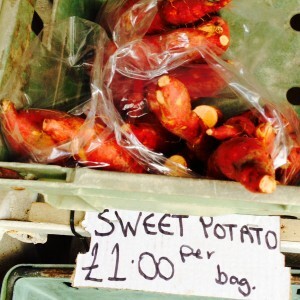 We are the only farmers in Jersey to produce sweet potatoes. 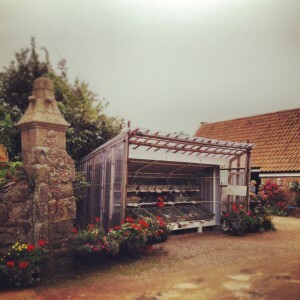 Our farm shop is at Manor Farm, Vinchelez, St. Ouen. It’s on the main road as if you’re heading to Les Landes Race Course, just after Vinchelez Manor de Haut on the left. Open 7 days a week 8.00 am – 6.30 pm. Lots of parking.